Don’t Replace Your Bathtub, Refinish Your Bathtub! Bathtub Refinishing is a cost effective alternative to replacing a bathtub that is worn out, damaged, or out of style with a dated color. Amazing Refinishing Raleigh North Carolina bathtub refinishing services include repairing bathtub chips, repairing cracks, and restoring the bathtub surface to look and feel like new. Why I Should Refinish a Bathtub? Bathtub refinishing benefits homeowners, hotels, motels, apartments and other property managers by providing a cost effective alternative to bathtub replacement. For example, a new bathtub may cost as little as $300, but when you add the cost of tearing down that old bathtub, removing it, getting rid of the bathtub and all the fixtures, and then dumping all the mess including that heavy bathtub at the landfill. Bathroom remodeling costs go up when you add the bathtub replacement parts, tile work, flooring, carpentry and permits. 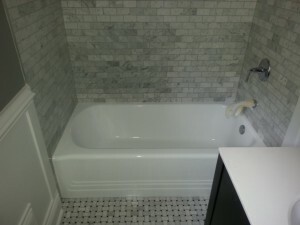 Bathtub refinishing requires only one contractor to be involved in the bathtub refinishing job, thereby saving you the time, mess, and cost of trying to coordinate multiple contractors. Porcelain tubs and sinks require the same preparation, since both are porcelain. *First, we check the tubs for damage. Any damaged caulking is removed. Next, we thoroughly clean the tub or sink. *The next step is to apply the acid etch to make the item porous. This is to ensure good adhesion.The item is rinsed with water and thoroughly cleaned again, this time with a solvent to make sure the item is completely dry. *We fix any damage such as chips, deep scratches, etc. While we wait for this process to dry we mask off all items in the bathroom to protect from any possible dust caused by the spraying process. A fan is put in the window to extract any fumes from the bathroom. *After all this is done, we are ready to begin the process of spraying.The first three coats are an special primer. *Next, we put on six coats of the topcoat, which is an acrylic urethane, (sometimes called “Synthetic Porcelain,” but in reality there is no such thing). “Sure Bond” is made specifically to be used on porcelain and is the product currently on the market that most resembles porcelain. This is how we make your tub or sink look great. *After the job is complete you can start to use your tub or sink the next day. If needed even same day! *All our porcelain tubs come with a 10-year limited warranty. You will be given a Care and Maintenance sheet for instructions on how to properly take care of your resurfaced bathtub along with your warranty paperwork and payment receipt. Check out our most popular paint colors and find the one that’s right for you- bestselling always in stock colors are: Kohler bicuit, pure white, off white.